When he was 18, Weaver started abusing prescription painkillers after a routine wisdom tooth removal left him with too many pills. Friends in his hometown of Pittsfield, MA introduced him to oxycodone and Opana, a dwindling supply of those led to Percocet and heroin, and the gaps between doses over the next ten years forced Weaver to realize he needed to quit. Tapering off didn’t work. Cold turkey only lasted so long before lingering, months-long withdrawal symptoms sent him running back. And like many opiate addicts, he was distrustful of prescription options like methadone, Suboxone, and benzodiazepines. Since using kratom to withdraw four years ago, Weaver has slipped a few times. His latest lapse was almost a year ago, and he hasn’t gone back to regular use. He’s been holding down a job as the assistant manager of a liquor store, which allows him to explore his interest in craft beer and whiskey. Weaver’s story is echoed online, among people of all ages and backgrounds who congregate in forums to share stories about how they’ve overcome their opiate addictions with kratom, an obscure plant that grows naturally in Southeast Asia. In 2012, when Weaver was quitting, kratom was legal nationwide and easily purchased online or in smoke shops. But that’s already changed. Actions by the FDA and a growing number of state-level bans are making kratom harder to buy, and harder for researchers to study. Already, these restrictions are curbing our chances of understanding what might be a powerful weapon in the fight against the US opiate epidemic. All photos: Bryan Menegus/ Gizmodo. This is what ground kratom leaves look like. In Southeast Asia where it grows, kratom leaves are usually chewed whole. The stuff bought online in the US arrives as a fine powder, ranging in color from tan to dark green. The bitter taste is akin to oversteeped green tea, and users who can’t stomach knocking it back with water (the “toss-and-wash” method) often mix it with chocolate milk or brew it into a tea. Though described in 1897 by English botanist Henry Nicholas Ridley as a “substitute for opium,” kratom didn’t gain a foothold in the US until the early 2000s, when whispers of its usefulness for quitting opiates or treating chronic pain showed up on sites like Erowid and Bluelight—around the same time opiate prescriptions and opiate-related deaths began to skyrocket. It’s not a drug one would seek out to get very high or to have their mind expanded. It’s more of a maintenance drug for those of us who could use a little help. Kratom is unusual because it’s a stimulant at low doses, and a sedative at higher ones. The effects are generally mild, producing a slight euphoria around 45 minutes after ingestion and lasting for three to four hours. Kratom isn’t an opiate, but it acts on the brain’s opiate receptors and shares opiates’ primary side effects of nausea and constipation. Where an opiate overdose can mean coma and even death, too much kratom leads only to vomiting up the overlarge quantity of plant matter. “It’s not a drug one would seek out to get very high or to have their mind expanded,” Andrew Flint, a friend of Weaver’s who introduced him to kratom, and himself uses it for chronic pain, said. “It’s more of a maintenance drug for those of us who could use a little help.” Anecdotal reports on Erowid support this assessment, as do my own experiences trying the drug. The effects are subtle and not that interesting in a recreational capacity. To date there are no known fatalities from kratom usage alone. Kratom remains unscheduled by the DEA, but the FDA threw it into legal limbo in 2014 when the agency issued an import alert that allows kratom shipments to be detained and destroyed without inspection. Historically, once an FDA import alert is issued for a product, it’s permanent. Restrictions are curbing our chances of understanding what might be a powerful weapon in the fight against the US opiate epidemic. There are no large-scale controlled trials of kratom’s effects on humans, but the FDA alert claims that kratom can lead to a terrifying list of side effects including, “respiratory depression, nervousness, agitation, aggression, sleeplessness, hallucinations, delusions, tremors, loss of libido, constipation, skin hyperpigmentation, nausea, vomiting, and severe withdrawal signs and symptoms.” After repeated requests, the FDA disclosed the evidence it had used to draw those conclusions. Among the documents is a 2012 joint review of the substance with the Department of Health and Human Services, which only lists human side effects as nausea, vomiting, and constipation. Robert Mozelsky, a medical officer with the FDA’s Division of Dietary Supplement Products, also shared 14 other studies as relevant to the agency’s stance on kratom. Many of these studies were uncontrolled, and in one of them the author himself was a participant. The few case studies that reported serious side effects described them as “rare” or a “coincidence.” Three of the studies describe the effects of plants in the mitragynine genus that are not actually kratom. Four states—Vermont, Arkansas, Wisconsin, and Tennessee—have banned kratom outright or effectively done so by scheduling two of the leaf’s key alkaloids, mitragygnine and 7-hydroxymirtrogynine. Vermont calls it a stimulant. Wisconsin and Tennessee list it as a cathinone, like bath salts and k2, which it is chemically unrelated to. Arkansas’ ban hinges on the findings of an individual physician, Thomas Atkinson, who has published no research on kratom. And now more states are jumping on the bandwagon: North Carolina wants to consider it a controlled substance, New Jersey is proposing heavy fines and jail time for distributors and users, and New York wants to penalize stores caught selling it. As a 24-year-old county clerk, David Carlucci noticed he was signing death warrants for people younger than he was who’d died of opiate overdoses. Now a New York State Senator, Carlucci says the counties he represents have seen over 230 overdose deaths in the past few years. Carlucci has introduced repositories and outpatient services, and he’s pushed for greater availability of Naloxone, a drug that can prevent overdose victims from dying. Carlucci is also the sponsor of a bill attempting to ban the sale and distribution of kratom in New York. “We have an epidemic going on, and we have this unregulated substance where people are profiting off of people to try to cure their addiction when we have no data to really back it up,” Carlucci said. In short, Carlucci wants to protect his community—from opiates, and from unregulated, poorly researched treatments. To date there are no known fatalities from kratom usage alone. Carlucci’s bill seeks to prevent the sale of kratom by levying fines and revoking liquor and tobacco licenses, meaning it would disproportionately affect brick and mortar stores. But Yassir Raouli, the owner of Brooklyn Smoke, said that kratom isn’t a source of revenue for his smoke shop. “We’ve probably had these capsules for at least three months, four months. So it’s not a product that moves,” Raouli said, pointing to a small jar. “It’s just a product that you need to have, being a smoke shop.” Regular users, like Flint, consider the kratom sold in stores to be “total crap.” Flint prefers to buy his kratom from online distributors who, to his knowledge, are largely located on the West coast, well outside of New York State’s legal jurisdiction. Products typical of headshop kratom, one of which is mixed with CBD, a hemp extract. Purchased from Brooklyn Smoke. 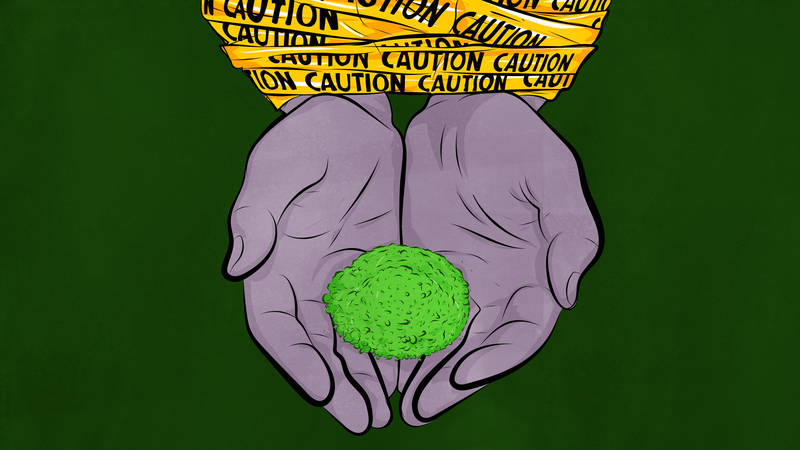 The pure plant form of kratom might show promise for addicts, but that’s often not the version of the product reaching the hands of consumers, or making headlines. More than half of FDA user reports involved claims of unclean manufacturing processes or kratom tainted with everything from buprenorphine to rat poison. Because of the financial risks involved in selling it, kratom manufacturers tend to be either wide-eyed evangelists or abject scumbags. Some of the latter cut their products with the very opiates that kratom users are attempting to withdraw from, and unknowingly ingesting those filler chemicals has led to seizures and even death in some cases. Even unadulterated kratom capsules sold in head shops are often not the powdered leaf at all, but concentrated extracts of the plant’s psychoactive chemicals—the hard liquor to kratom’s beer—which can hasten dependence in users. McKenna marks his kratom as “not for human consumption” and ships it to customers, hoping those words will help him avoid FDA scrutiny. A sample from McKenna’s company. The “white” in the name is derived from the leaf vein color, not the color of the powder. The overwhelming majority of anecdotal reports on kratom suggest it has clinical value, but they’re just that—anecdotes. What everyone I spoke to agrees on is that we need more research to know for sure. Studies on mice, rats, and dogs also show that the component chemicals in kratom have promise, but controlled human trials are needed before it can be regulated and safely prescribed to patients. “If it’s seen that it can help then that should be the case,” Carlucci said of potentially prescribing kratom. Even McKenna, whose livelihood depends on his ability to sell kratom, thinks it should be regulated. He wants to see standards in place to keep the product safe and pure. Regulation would mean treatment without the fear of accidentally ingesting cadmium or rat poison.